I remember being in the 6th grade, and I was sleeping over at my best friend Bill’s house… Wait, no, not that first time. Jeez, I might not even know you. Get your mind out of the gutter. This is about the first time I played a roleplaying game. Anyway, my friend and I were talking about RPGs, or how I understood them at least. I had played Final Fantasy and Dragon Warrior on the NES. Final Fantasy II for the Super NES had just come out and I was geeking out about it at the time. But when he said, “No man, I mean a roleplaying game like Dungeons and Dragons,” I didn’t know how to respond. I had heard of Dungeons and Dragons before, but I had no clue what he was talking about. Having grown up in the south, I had heard about the supposed (and laughable) connection of D&D to witchcraft, demons, and other strange occult related phenomenon, and was immediately interested (hey, I was a kid who loved horror movies, give me a break). The “mysteries and dangers” of role playing games still make me laugh today. My friend retrieved his older brother’s gaming stuff: some books filled with cool art and strange charts, a few modules, some maps gridded out on graph paper, and a purple Crown Royal bag that clattered when he set it on the table. It was what was inside the bag that puzzled me the most. Bill spilt the contents of the purple bag onto the table, and out fell a collection of small, multicolored, geometric shapes, each dancing on the tabletop with a distinct sound that I can identify to this day. They were dice. I never knew dice came with more than six sides, and these things had up to 20! They looked of alien design. Within a week I had asked my parents to take me to Walden Books so I could buy my own copy of Dungeons and Dragons. Almost all of the books there didn’t look like the ones my friend’s brother had, so I decided to buy the Basic D&D box set instead. On the cover was a lone warrior in a dark cave facing down a huge red dragon, its claws raised, its head bristling with horns. It looked like the cover of a death metal album and it was one of the most badass things I had ever seen at the time. And thus began my delve into the roleplaying game hobby. Fast forward twenty two years and it’s something I still look forward to every week. I don’t play as often as I used to, which is why I suppose I’ve decided to write about GMing/playing. I’ve played many games over the years, and there’s many more I’d like to play if given the time. So long as the game is fun, you won’t find me griping . I’m a big fan of many of the Old School Renaissance games (particularly Astonishing Swordsmen and Sorcerers of Hyperborea: http://www.hyperborea.tv), Pathfinder, 5th ed D&D, Shadowrun, Savage Worlds, Fate, Call of Cthulhu, D20 incarnations (Mutants and Masterminds in particular: http://mutantsandmasterminds.com), GURPS, and the list could go on and on. I don’t feel like there’s one game, setting, or system to rule them all. This is a small portion of my gaming collection. These days when I run games, I tend to gravitate toward systems and settings that lend themselves toward narrative play and the simplest rules. I feel like, given the amount of time I have to devote to my hobby, I’d rather focus on the setting and characters rather than having to know every rule or modifier to keep the game flowing. There’s only so much memory I can devote to things these days, and unfortunately the modifier for slippery ice for blahblahblah game isn’t at the top of that list. Hell, I can barely manage math with results higher than thirty. I realize that many of the games I listed above aren’t rules light, which is why I prefer to play in those systems rather than GM them (thanks Bobby, Derek, Ken, Phil, and everyone else). I’ve also played with a number of groups over the years and have been blessed with many positive gaming experiences. I’ve been, more or less, consistently playing with the same gaming group for the last seven or eight years, with the occasional comings and goings of players due to a myriad of reasons. I’ve met a ton of interesting people over the years, and, thankfully, still remain friends with most of the people I’ve gamed with for a substantial amount of time. The relationships I’ve developed with these awesome people make me love my hobby that much more. Since roleplaying games are such a collaborative storytelling medium, I feel like this blog should be like minded. Send us an email on your thoughts about our subjects. I, in no way, believe anything I write on this blog is an absolute truth, as there are many, many, different ways, systems, settings, and moods in which to game and have fun. To each their own. I am, however, interested in hearing about your opinions on the topics we discuss. I can always learn a thing or two, about a thing or two. 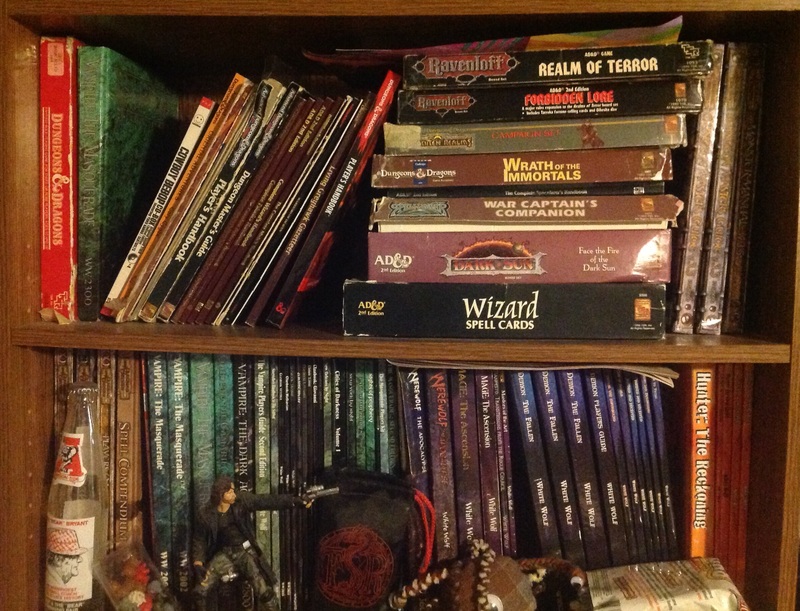 Thanks for reading and let us know about your first RPG experience and why you stuck with the hobby down in the comments below. 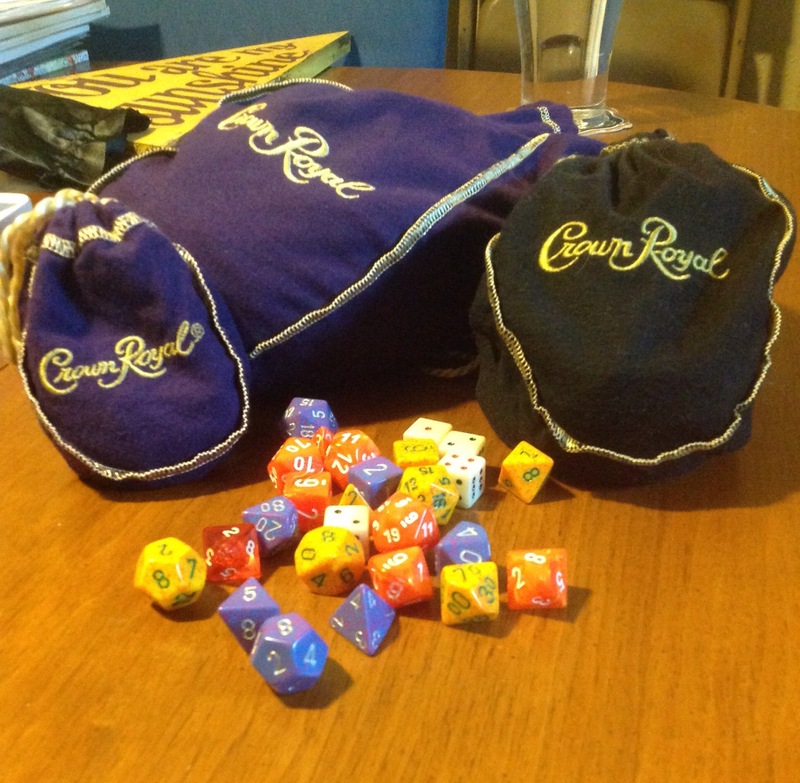 I am curious, aside from Crown Royal liquor bottles, are dice the second most accounted for things being carried around within those sweet purple (or black, or monogramed blue) bags? Let us know. Be sure to check out our other posts, such as my Tales from Teemo’s Folly series, a fictionalization of our current weekly Star Wars Edge of the Empire campaign. If you enjoy what you’ve read, click the Like button and follow our blog.